With an estimated population of over 11.5 million people, Ohio is the 34th largest state. The capital, and largest city in Ohio is Columbus. Other major cities in the state include Cleveland, Cincinnati, Toldeo, Akron, Dayton, Parma, Canton, and Youngstown. Ohio is home to many colleges and universities, including 13 state universities such as The Ohio State University, Bowling Green State University, Kent State University, University of Cincinnati, Ohio University, University of Akron, University of Toledo, Miami University, Cleveland State University, and many more. Ohio is typically a very important state politically, as it is a swing state, and many candidates travel there and hold rallies and speeches. There are also many professional sports teams that claim Ohio as their home, including the Cincinnati Reds, Cleveland Browns, Cincinnati Bengals, Columbus Blue Jackets, Cleveland Cavaliers, Cleveland Indians, Columbus Crew, Ohio Machine, and more. Ohio is home to many other sporting events such as the CART World Series, NASCAR Nationwide Series, IndyCar Series, Can-Am, Formula 5000, IMSA CT Championship, PGA Tour events WGC-Bridgestone Invitational and Memorial Tournament, WTA Premier 5 tennis tournament, many college athletics, and is home to the Pro Football Hall of Fame in Canton. Ohio is a state with a lot happening, and is home to many events every year that draw in millions of people, both locals and visitors. With so much going on in the state every year, events have to compete with each other to get guests to attend them. One way to stay ahead of many of these events is to rent a mobile LED Jumbotron at yours. Renting an outdoor big screen TV creates a whole new feel at any event. Your guests will love it, sponsors love it, and that means you should love it too! There are many ways the LED mobile screen can be used. We can display live video feeds from the event. With our full video production team and professional equipment, we can create a close-up live experience that every one of your guests will be able to see, even if they are in the back row. We can also show pre-recorded videos, DVDs, slideshows, sponsor logos or ads, social media feeds, scoreboards, or just about any other media you could think of. The LED video wall can also be used to make event announcements such as the schedule, upcoming events, weather alerts, or other messages to your crowd. On our video boards we can display any combination of those, and help you create a memorable experience for all your guests that will keep them returning year after year. 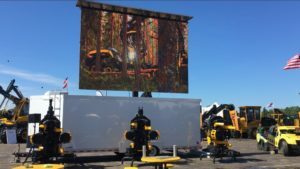 Fire Up Video rents mobile LED Jumbotron screens for outdoor events of all types across Ohio, as well as many other states across the Midwest. Our mobile video screens also travel to events of all size in states such as Indiana, Tennessee, Michigan, Wisconsin, Minnesota, North Dakota, South Dakota, Nebraska, Tennessee, Kentucky, Kansas, Colorado, Iowa, Missouri, Illinois, and more. For more information, or to see how our LED Jumbotron boards can help your event, please contact us at 612-759-1012 or baum3@earthlink.net.